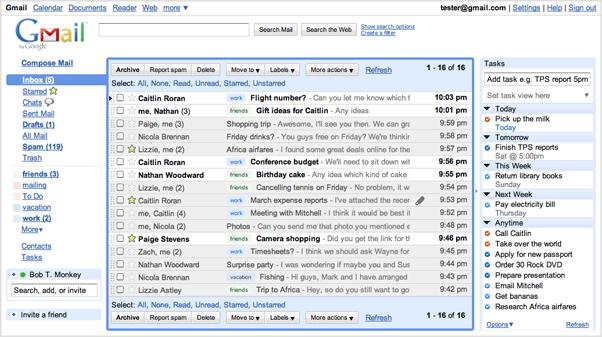 Ok, I’m a huge fan of gmail. And I’m actually pretty happy with buzz as it’s opened up conversations with people I don’t normally interact with via standard web-based social networks. It’s also great how quick Google is to implement enhancements to these products. But this has led to one major issue I’ve had with google over the past couple of years – their updates frequently break third party plugins that leverage google’s API’s. Of course I wouldn’t necessarily expect Google to work hand-in-hand with every single third party developer, but they should at least keep some major ones in the know. In this case I’m referring to Remember the Milk. One of the most useful applications I’ve encountered on the web is the Remember the Milk plugin for gmail. For those who aren’t in the know, RTM is a simple task manager that lets you easily add tasks by typing things like “Send in rent check Thursday”. But really there isn’t anything that special about RTM when compared with the vast array of competitors (PhiTodo, Taskbarn, Remindr, teamtasks, Task2Gather, TheBigPic, Producteev, Basecamp, Planzone, and LifeTick, to name a few). In fact, RTM really disappoints when it comes to organizing and planning big-picture goals (TheBigPic and LifeTick are both much better for this). But the key redeeming feature for RTM is the gmail plugin. The RTM gmail plugin is incredible. It is one of the few utilities that I absolutely rely on to remain organized on a day-to-day basis (others include gmail and gcal). And the key feature of the gmail plugin is that you can simply star an email and have it automatically become a task in the RTM side panel. This is extremely helpful for keeping up with emails. I can prioritize and postpone responses by relevance, and clicking on the task in the side panel will pull the relevant email up so I can address it right away. These features are especially critical since probably 70% of my tasks come as emails. However (and this is where my beef with gmail comes in), Google frequently updates the code for gmail, and many times that actually breaks features in the RTM plugin (with over 90 instances of a break and a required RTM fix!). It’s generally only a relatively small break for a day or so. But for for the past three weeks (up until late Monday night), the RTM plugin has been completely down. This is, of course, because of Google’s wide-spread updates and code freeze associated with the release of Buzz, though we had no way of knowing that when the issue first cropped up in the RTM forums. So it’s mildly frustrating relying so heavily on a plugin that is at the mercy of every minor update pushed by Google. I’m hopeful that Google will try to work more closely with RTM in the future. Or maybe they could improve their own native Tasks application to bring it on par with RTM’s other features (though that’s obviously the more monopolistic solution). Buzz is awesome, but Google needs to play nicer with third party applications, especially as we become more reliant on these cloud services for day-to-day work. You should try out the RTM Gmail plugin (make sure to use the actual Firefox or Chrome addon, the labs gadget isn’t even close). I don’t know how I kept track of things before it. I’ve definitely had trouble keeping up with tasks over the past three weeks while it went dark (sorry to everyone for that).